Valentine’s Day flowers have the power to convey what can't be explained in words, and there’s no better way to express your love this Valentines Day than with a beautiful bouquet of red roses, or a flower arrangement and teddy bear, carefully crafted by our local florists in South Africa. If you are looking for gift ideas, we’ve also got a wide variety of Valentine’s Day gifts and hampers that will be sure to ignite the romantic in you. Valentine’s Day in South Africa is on Friday, 14 February 2020. We can deliver flowers on Valentine’s Day, which falls on Friday, 14 February 2020, virtually anywhere in South Africa. Please note however that due to the increased demand for fresh flowers around this time, flower orders should be placed as early as possible to ensure delivery on or before Valentine’s Day. Valentine’s Day gifts and hampers need to be placed no later than 12:00pm on Wednesday, 12 February for delivery on Friday, 14 February in most towns and cities in South Africa. For remote areas allow more time for delivery. To avoid disappointment, please place your orders as soon as possible. 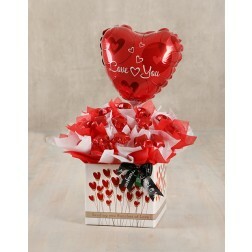 Our gifts and hampers get couriered from Johannesburg and cannot be delivered on weekends.